Corolla is one of the most popular North Carolina beaches for one special reason: the 4×4 area, slightly to the north, known as Carova! If you have a vehicle equipped to take advantage of this opportunity I would highly recommend it as part of your Outer Banks vacation experience. Enjoy the sunshine, play in the waves, and possibly see the famous wild horses! Here is a quick rundown of what you need to know before you go four-wheel driving. For the protection of our beautiful coastline’s wildlife and preservation as well as other visitors, there are some rules and regulations that you must follow when exploring the 4×4 area. While this isn’t a full list, here are some main parts. Your vehicle must also be licensed and registered for highway use which means motorcycles, all-terrain vehicles, and utility vehicles are not allowed. Vehicles with more than two axles are not permitted for driving on the beach. Likewise, utility vehicles are not allowed and all-terrain vehicles are prohibited for non-residents. These vehicles do not do well in the sand and will likely get stuck. If you get stuck you have two options: call a commercial towing service or figure out a way to get your vehicle out yourself. Either way, you’re going to either spend a lot of money for a towing service or possibly cause damage to your vehicle! Any law applicable on the roads of North Carolina also apply to off-road vehicles, including following posted speed limits (15 mph when traveling within 300 feet of any person or animal on the beach), prohibited open containers, and seat belt laws. Make sure to have your license, registration, insurance up-to-date and easily accessible. Pedestrians always have the right of way so make sure to keep an eye out for other beach-goers including pets. If closer than 300 feet, reduce speed to 5 mph. 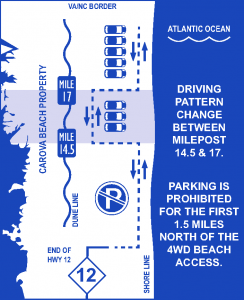 As of 2018, From the Friday before Memorial Day through Labor Day, between 9:00am and 5:00pm, all vehicles are to be parked in the area east of the dune line, but west of the hard packed sand, and adjacent to the water’s edge when parked, and the middle of the beach is considered the “driving lane”. No personal items or vehicles are permitted within the driving lanes. No parking is permitted on the beach prior to milepost 14 where the beach is not wide enough for other travelers. There are two types of recreational parking permits: seasonal and 10-day. These permits are nonrefundable and nontransferable so make sure you get the one that best suits your needs. You can apply for your permit here. You must print all pages of the permit. Page one must be signed in order for the permit to be valid. Keep this page in your glove box.A printed proof of permit must be on display in the driver’s lower corner of the windshield while on the beach. 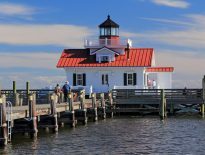 Seasonal passes are free to Currituck County residents and property owners and available to visitors for $150. 10-day passes are $50 for visitors. Let air out of your tires to 15-20 psi before getting to the ramp. This gives your tires more surface area and therefore better traction. Over-inflated tires will make it more likely for your vehicle to get stuck. Pick your destination in advance and pay special attention to the tides throughout the day! At high tide, many areas are only wide enough for one lane or become impassible altogether. You don’t want to wait until the last minute and be stuck or wind up in dangerous conditions. Fill up your gas tank before driving onto the beach as there are no gas stations in the 4×4 area. Watch for wild horses! The horses have free reign to roam the beaches of Carova and are protected by law. If you happen to see them, do not attempt to feed or pet them and remain at least 50 feet away at all times to avoid a citation. They are an amazing sight though, so make sure you bring a camera! 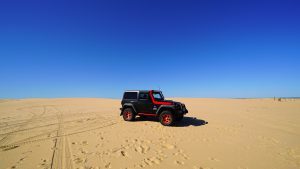 While this covers almost everything you need to know about the four-wheel-drive area of Carova Beach, any other questions you have can be answered by the Currituck County Department of Travel and Tourism. Now that you know all the tips and rules, all you have left to do is find the perfect Corolla Beach Vacation Rental and enjoy your vacation!